I love advent calendars. My family does one every year. I fill each box with a toy or treat and a Christmas tradition. It helps us slow down and enjoy the season. 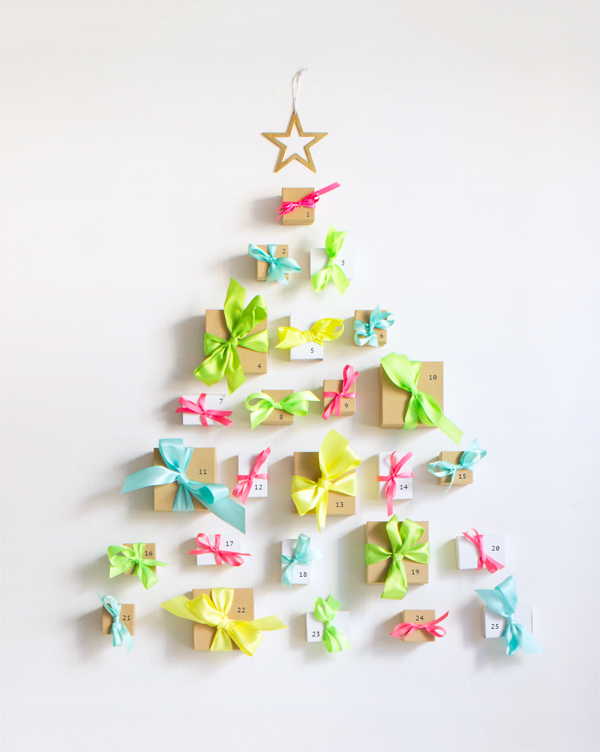 Today we’re sharing a neon ribbon advent calendar. I love the modern twist on traditional colors. We attached it to the wall in the shape of a tree with double sided removable wall tape. 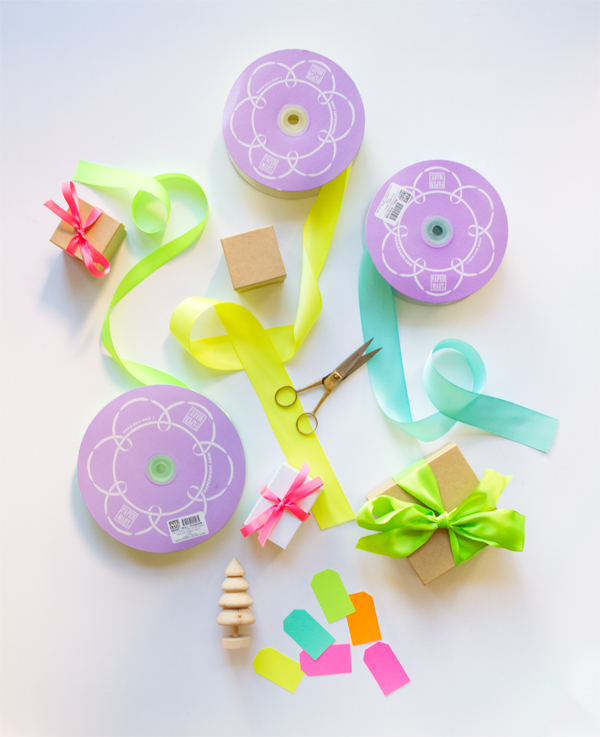 Every year in November I place a big order to Paper Mart to stock up on ribbon before the holiday season. My favorite is the Double Faced Satin, it’s thick and luxurious. 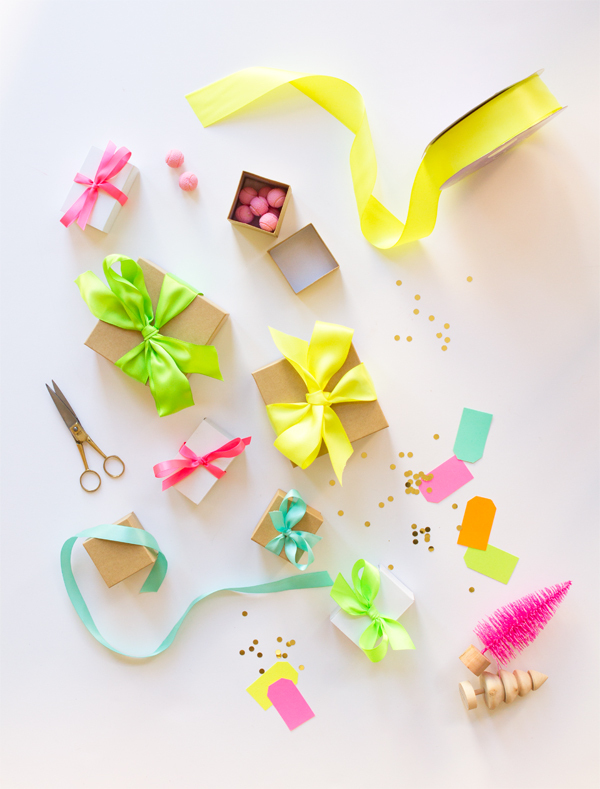 Fill you boxes with treats, trinkets or activities. Wrap with ribbon. Attach the boxes to the wall in the shape of a Christmas tree with gaffer’s tape. Enjoy!! What a cute, fresh and practical advent calendar, I love it. I’m amazed by the variety of shapes and decor advent calendar can have. I made mine yesterday and it’s so different while function is exactly the same – you can see it on my blog. Thanks for those great calendars you present this year. I think neon is such a refreshing way to style for Christmas, I really like it! Cute! Do you have any suggestions for the inside of the boxes? I can’t think of much that would fit in those tiny boxes. Do you repeat a lot of the little gifts (like there are stickers in 3 or 4 of them)? This is so much sweeter than a store bought advent calendar! Such a cute calendar! You did a fabulous job!